Note: It’s crucial for you to go through our comprehensive buying guide before reading our product reviews to make the right decision (especially if you are a complete beginner). Binoculars are a must for every avid hunter. Whether you are an expert or just getting started, you will need a pair of binoculars to locate your preys. To an extend, they are deemed to be the most important hunting gear. Are you ready to take your hunting hobby to a whole new level in 2016? As you might realize, choosing the best binocular that is suitable for you can be really challenging, especially if this is your first time buying a binocular. In order to assist you in making a wise decision, we put up this ultimate guide, best binoculars for hunting. Don’t worry, we will be guiding you step by step and by the end of this post, you should be able to pick one that suits you. We also rated the top 8 binoculars so you don’t need to go around searching for a gem in the haystack. If you are completely new to binoculars and you want to read through the buying guide, just scroll down to the end of the post. As promised, we had reviewed the top 10 binoculars for hunting that should be great fit for you depending on your personal needs and your available budget. If you go through the criteria above, you should at least know what aspect to pay attention to. Note: Don’t get me wrong, these binoculars aren’t the best of the best or else each of them will be around the $2000 – $10000 range. However, they do offer tons of value for the price you are paying for. It’s hard to make the right decision when you couldn’t make comparison between products available in the market, and we know it. Therefore, we simply the main characteristic in the comparison table below listing down all the important specifications of those binoculars. However, before going through the table, it’s important you know what the headers mean. The notes below will help you do so. Please go through them. WT (Weight) – It’s the weight of the binocular. It’s measured in Ounce (Oz). FOV (Field Of View) – It represents the range of view at 1000 yards. It’s measured in feet. Important Note! You have to scroll through the table from left to right in order to view all the information in the table. Sorry for the inconvenience as there are too many information that should be taken into consideration. Frankly, we are hesitant to include Leica Geovid in this list due to the fact that it’s too highly priced and might not benefit you. However, if you really have the budget with experience, then it would be fun to give it a shot. Of course, it’s not the only high end binocular in the market. 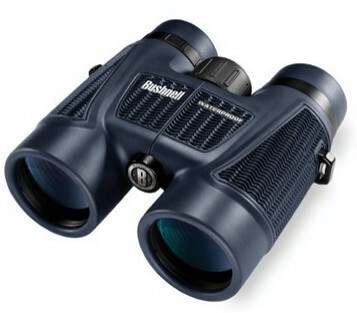 Swarovski is another brand that produce quality high-end binoculars but at double the price. If you really want top notch experience at an affordable price, Leica Geovid is the way to go. I have to say I am pretty amazed at Bushnell H20 binocular. Although it’s not one of the top notch product out there, it certainly offers the best value for it’s price. At around $80, it comes with most of the specifications that you would normally see in higher priced products. Some of it’s great advantage are being waterproof and fog-proof. Also, it uses BAK-4 prism which improves the quality of image. Although the lens aren’t ED lens (high quality extra low dispersion lens), they do come with HD lens which are better than normal ones. Another plus point will be usability. At the magnification power of 8, it’s easier to stabilize the image and it’s pretty great for short range hunting. Also, it’s pretty light, only 25 ounces, and it has a large field of view of 410 feet at 1000 yard. These characteristics make it easier to handle. The eye relief is 17 mm, great for both with and without spectacles. One drawback of this product is that the quality of image produced isn’t comparable to higher quality ones. The image isn’t as shape as some professionals expect it to be (although in my opinion, it’s good enough for beginners). This binocular is not fully multi-coated which means that some air to glass surface aren’t coated. Also, the prisms aren’t phase corrected. These problems collectively add to the low quality image produced by this product. The manufacturer didn’t specify any warranty for this product. However, they are willing to refund you a new product or your cash if you are unhappy with the product within two weeks. Just in case you are too busy to go through the reviews in Amazon, this product has a relatively high rating of 4.6 stars. Who is this binocular for? First of all, the design of this particular binocular is pretty nice, they call it the mossy oak theme. It’s pretty special compared to the majority of them that focus on classy design. You will be very pleased with the quality of image seen through this binocular. It’s very well built with ED lens and BAK-4 prisms. In order to improve the images further, the Carson 3D series is fully multi coated and the prisms are phase corrected. Seriously, even experienced hunter will be pleased by the quality of image. The physical aspect of this product is great too. Needless to mention, it’s made to be waterproof and fog proof. On top of that, the durability of this product is made to last while the weight is pretty low, at 22 ounces. This makes it great for hunting. One particular drawback is that the field of view is not up to what I prefer, it’s 314 feet at 1000 yards. Sometimes, it’s hard to scout around if the field of view is too narrow. This is not too bad though, just take into consideration before making your decision. Eye relief is at 16mm. It’s the minimum threshold set for spectacles wearer, so it’s hard to say for sure if you will feel comfortable using it while wearing spectacles. However, there are other users (those wearing spectacles) that gave positive review about this product, so it shouldn’t be a problem. Warranty isn’t specified by the manufacturer. However, it’s possible to return the product or ask for a cash refund if you feel that you are uncomfortable with the product within two weeks. So far, there isn’t anyone asking for a refund for this product. Just to add on, this product has an incredibly high rating of 4.8 stars in Amazon with no 1 and 2 stars rating. All ratings are 3 stars and above, pretty impressive. Nikon has been a reputable brand and is known to produce the best quality product as compared to it’s competitor of the same price range. This is especially true for Nikon 7245 Action Ex Extreme binocular (which is something like Bushnell H2O binocular). This binocular is really great if the majority of your hunting activities are in semi-darkness. Having a magnification power of 10 and a large objective lens of 50 mm it allows more light to enter thus giving you a brighter image. In case you are making comparisons with other binoculars, the exit pupil is 5 mm and the twilight factor is 22.36. Aside from being waterproof and fogproof, the body of this binocular is rubber-coated which gives you better gripping, especially if you are hunting around swampy areas. Also, BAK-4, partially phase corrected prisms and ED lens are used to enhance the image quality (slight better than Bushnell H2O). You can expect for a fairly high quality image, though not comparable to those within the top notch range. For it’s magnification power, having a field of view of 341 feet at 1000 yards is really great. Most binoculars that have 10x magnification power wouldn’t have field of view above 300 feet at 1000 yards. One of it’s main drawback is that the size will be slightly larger compared to other binoculars in this post due to the fact that the objective lens are large, at 50 mm. However, looking at the weight which is only at 25 ounces, it’s pretty good. Also, it’s only multi-coated, leaving some glass to air surfaces not coated. This means that the quality of image produced wouldn’t be that sharp as we want it to be. Although there are clearly some flaws, it’s a pretty smart choice if you are to choose this product looking at the fact that it’s only $139. It’s average rating in Amazon is 4.6. Another great thing about Nikon’s binocular that is worth to mention is that whether or not the binocular you bought is within the warranty period, Nikon will repair/replaced any damaged part of the binocular with no question asked for just $10, pretty good offer. On top of that, it comes with a 25 years limited warranty. By any chance if you feel like returning the product, it’s possible to do so. Just contact them via Amazon or contact details provided. One of the best, robust binocular you can ever find is the Leica Geovid 10 x 42 HD Laser Rangefinder Binoculars. Especially as a hunter, you will find that this binocular will give you a marvelous hunting experience, stepping up the activity altogether. First of all, let’s look at the rangefinder function it offers. Basically, this binocular uses the laser technology to calculate the distance between you and a targeted object (most probably a prey). It works by calculating the time a laser is emitted and reflected back to the binocular. Such technology presents a fairly accurate result that you can rely on. It can calculate accurate distance of any objects or animals you target up to 1750 yards which makes it extremely fun for sniper hunting. Besides, there are various functions that would be fun exploring. There are scan mode, atmospheric condition and ballistic curve which gives you some details about directions, weather conditions and other useful details. It’s extremely cool to have these functions as it’s pretty much like a military binocular. Physical wise, it’s made to be waterproof and fog proof. In order to further enhance it’s quality, this binocular is made using aluminum which is a strong and lightweight material. Image quality is near to perfect. It produces extremely high quality image with the use of high quality ED lens as well as phase corrected BAK-4 prism. Furthermore, it’s fully multi coated (FMC) to reduce the lost of light. Eye relief is adjustable which makes it suitable for everyone, doesn’t matter of you are wearing spectacles or not. Field of view is rather large at 331 feet at 1000 yards. I guess it’s really hard to find a problem with this binocular. If you really want to be extremely picky, one small problem is that it’s a little on the heavy side at 33 ounces. Some people (especially hunter) prefer something lighter. However, you have to remember that this product is both a binocular and a rangefinder, so it’s okay to be slightly heavier. So, what’s the real problem? I guess it’s the price. At $3249, it’s just too expensive that most people wouldn’t even consider of purchasing it. However, if you are already planning to get something really good like this, you should really pick this one over other brands because it’s much more expensive, up to two folds. Although it’s expensive, most people that bought this product don’t have any regrets. Take a look at their average ratings, it’s 5 star (full rating). It means that each and every customer are extremely satisfied with the product they are paying such a high price for. Warranty wise, there is a 3 years full warranty in which the manufacturer will repair/replace any damaged part of the product. After three years, you will just need to pay $35 and they will repair the binoculars. Vanguard Endeavor is one of the great binoculars for hunting that is comparable to Carson 3D (although slightly lower in terms of image quality) and other great Nikon binoculars out there. They operate on high quality ED lens and BAK-4 partial phase corrected prism. Also, it’s fully multi-coated which is truly unbelievable looking at it’s price point. Physical quality wise, they are waterproof and fog proof and pretty durable. With magnification power of 8 and field of view of 367 feet at 1000 yards, it’s one great binocular recommended for short-to-mid range hunting. Also, the weight is pretty light which improves your mobility (exactly what you need in short-to-mid range hunting). Also, the eye relief is relatively long at 19 mm which makes it great for spectacle wearers. I am not sure if it’s coincidence, but most of them that really like this binocular are from the older age range. One of it’s disadvantage is probably the low twilight factor at only 18.3. This means that it will not work really well when used in dim light areas. If the majority of your hunting activities revolves around dim light areas/time, then this might not be for you. It has a relatively high rating of 4.6, not perfect, but good enough to guarantee the quality of product. Most of them are actually happy that the price paid is relatively low as compared to the quality of image this binocular can produce. Warranty wise, Vanguard Endeavor ED comes with a premium lifetime warranty. Meaning to say, if at any point of time you find that there is a problem with the product, they will gladly repair/replace the binocular for you. However, it doesn’t cover damages caused by misused, failure to follow operating instructions, abuse, or use with improper or faulty equipment. This product is a cheap alternative to the Leica Geovid in case you are searching for a hunting binocular that comes with a rangefinder that you can still afford. It’s the cheapest binocular with rangefinder you can ever find, priced slightly below $1000. First of all, it offers the rangefinder function which is normally present in high range binoculars. It uses the laser technology (like Leica) to determine the distance of a targeted object. It’s fairly accurate up to a distance of 1000 yards which are really good enough for most hunters. Not to mention, the quality of image produced is extremely clear and sharp. It uses high quality ED lens as well as phase corrected BAK-4 prisms. Like all high quality binoculars, all air to glass surface are fully multi coated. The weight is rather light at 31 ounce especially when you compare to other rangefinder binoculars. Also, it’s waterproof and fog proof. In addition, it has a good length of eye relief of 18 mm that is suitable for everyone irrespective of whether you are wearing spectacles or not. Frankly, it’s an extremely great binocular. However, I know some of you are curious about how this binocular perform when compared to Leica Geovid (the one reviewed above). In terms of image quality, although I would say Leica Geovid performs slightly better, there isn’t distinct differences between both. However, when it comes to the rangefinder ability, Leica Geovid is definitely much more superior as compared to Bushnell Fusion. First of all, Bushnell Fusion can only calculate the distance of an object accurately within 1000 yards. And even so, the accuracy in Leica Geovid is better than Bushnell Fusion. For example, if both reads a reading of 400 yards, the actual distance could be 395-405 yards for Bushnell but 398-402 yards for Leica. The room for error is lower in Leica. While it’s obvious that this binocular isn’t comparable to Leica Geovid, it’s actually still worth the buy due to the fact that it’s still very much better to most of the binoculars out there. It comes with a limited lifetime warranty whereby they will repair/replace damaged parts or replace an exact new binocular for you if the fault in on their side. Any misused or damaged caused by you are not included in the warranty. They don’t offer any fix prices service like what Nikon and Leica did. The rating in Amazon is 4.4 star, not too bad. If you are looking for a high quality hunting binocular that can produce large, clear and sharp image, Vortex Viper HD is the way to go. It has a 12x magnification power with a large objective lens of 50 mm to ensure maximum level of brightness. Having that said, it’s not recommended for beginners as it would take some skills to stabilize the image at 12x magnification. Also, it’s important to consider the average range in which you are going to use this binocular. This binocular is better suited for long range hunting/scouting. In order to produce a sharp image, Vortex Viper utilizes high quality ED lens as well as phase coated BAK-4 prisms. Like other high quality lens, Vortex Viper is fully multi coated which greatly increase the contrast to produce color-accurate images. Physical wise, it’s waterproof and fog proof. In addition, it’s body is rubber-coated making it firm and improve gripping ability. It’s pretty durable as it’s made of strong and lightweight material. The weight is just 28 ounce which is pretty light considering that it has such a large objective lens of 50 mm. Also, if you are mostly hunting around dim light areas/timing, you will really love this binocular as it will produce bright images even in dim light areas. The twilight factor of 25 is really high when compared to other binoculars. Though it’s a perfect binocular if you are looking for higher magnification ones, there are some setbacks too. For example, the field of view is considerably small of 252 feet at 1000 yards, making it not suitable for activities that require multiple focus, such as watching a football tournament in a stadium. Another thing to note is that the eye relief is 15mm. It might be uncomfortable to use for those who wears spectacles. The warranty offered by Vortex is presumably the best as compared to most of the binoculars manufacturer out there. It’s a premium life warranty whereby they will repair or replace damaged part of the binocular for free for your whole life, cool right? Also, it’s transferable. Meaning to say, if you sell/give the binocular to anyone, they can utilize the warranty. This product scores a 5 star rating. Every users seem to like it very much probably due to the fact that it’s of high quality. Unless you are entirely new to binoculars, you will probably know that Bushnell Legend Ultra is an extremely close competitor to the Vanguard Endeavor (which is reviewed above). While some may choose Vanguard Endeavor over Bushnell Legend because it’s perceived to be built with stronger/better materials, the quality of image produced by Bushnell Legend is actually slightly better. First of all, Bushnell Legend Ultra utilizes better ED lens. They are using RainGuard HD water-repellent lens coating to further improve the quality of lens. Also, the prism used is BAK-4 which is being phase corrected for better image contrast. Like Vanguard Endeavor, it has fully multi coated lens. Also, it’s one of the lightest binocular you can ever find, weighing only around 22.5 ounce. While it’s light, the strength and durability of the product is not being sacrificed. It’s fully waterproof and fog proof too. In addition, the field of view of 341 feet at 1000 yards is rather large for a 10x magnification binocular making it extremely convenient for hunting. While field of view isn’t that important to some professionals, beginners might find binoculars with larger field of view better. In my opinion, Bushnell Legend Ultra and Vanguard Endeavor perform equally well. Just pick the one that is visually appealing to you and you will be good with it. The product comes with a limited lifetime warranty in which the product will be repaired/replaced for free if there is any defect or fault from the manufacturer. If the fault comes from you then it’s not under this warranty. How to choose the best binocular for hunting that suits me? Before going down to the individual specification of the binoculars, it’s better for us to understand the basic and advance features as well as how they will affect the overall user experience – image quality, user-friendliness, suitability. Note: Binoculars are often specified based on a set of numbers. For instance, 10×42 means that the magnification is 10 and size of the objective lens is 42mm. Also, this guide is specially tailored to help you choose a hunting binocular. If you are choosing a binocular for other purposes such as bird watching, or any other reasons, you have to take other factors (which is not in this post) into consideration. The strength of magnification of a binocular is represented by the first number in the specs detail of a binocular. For example, for a 10×42 binocular, the strength of magnification is 10x. This means that the real image will be 10 times bigger than the object from your point of view. While many thought that the higher the magnification of a binocular, the clearer the image produced, it’s not true. Generally, the higher the magnification power, the harder it is for you to stabilize the image. Even the slightest movement of the binocular will produce a blur image. Anywhere above 12x magnification is not recommended for hunting’s sake due to the fact that you will be moving around most of the time. In terms of hunting, it depends how far are you from your prey. If long range identification is needed, going for 10x-12x magnification power will help. If you are just starting out, 8x should work pretty well. Personally, I advise you to invest in a zoom binocular that allows you to adjust the magnification level you will need during different situations. The size of the objective lens of a binocular is specified by the second number of the specs detail. For example, a 10×42 binocular means that the objective lens of the binocular is 42mm in diameter. Generally, the larger the objective lens, the more the light it can capture to produce a brighter and clearer image. However, the larger the objective lens, the larger the size of the binocular. Therefore, you have to make a choice, are you willing to sacrifice brightness for a compact binocular (more handy) or the other way round? In my opinion, the best approach is to choose one that is bright enough while it’s not that big in size. Normally, quality ones will have both characteristics, compact and bright. Of course, they do cost more. Why is exit pupil important? It determines the maximum amount of light that will be transmitted to your eye. Generally, the higher the exit pupil, the brighter the image, until it reaches the exact size of your pupil. For example, during normal conditions, our pupils will be around 2-3mm. Therefore, you wouldn’t want binoculars with an exit pupil lower than 3 or else the amount of light entering your eyes wouldn’t be maximized and the image wouldn’t be as clear as it supposed to be. However, if you are going to use the binoculars in dim light areas, which is most probably the case as the best hunting timing are during sunset and sunrise, the ideal diameter of exit pupil should be around 4 because that’s the diameter of your pupil. Field of view is the size of area that can be viewed using a particular binocular. It’s determined by measuring the distance between one extreme end to the other at a distance of 1000 yards. Meaning to say, if the field of view of a binocular is 320 feet, it means that the distance between two visible extreme ends are 320 feet at a distance of 1000 yards. It’s always better to have a larger field of vision than smaller ones. But then again, it’s up to you to decide. If you’re primarily hunting for smaller preys such as rabbits, smaller field of vision wouldn’t pose a large problem for you. Anything around 310 feet to 350 feet are great in most situations. Also, the field of view is generally smaller if you are using a high magnification binocular. As mentioned above, it’s better to get a zoom binocular for greater user experience. Basically, eye relief is the optimum distance between your eye and the lens of the binocular that will produce a clear image. For a normal individual, it’s more of an individual preference, whether you like to view the binocular closely or having a small distance in between. However, for those wearing spectacles, you should go for binoculars with eye relief of at least 16mm or else it would be uncomfortable. The type of lens inevitably affects the clarity of image seen through the binoculars. It’s always better to have ED (extra low dispersion) lens. HD lens are high definition but does not guarantee that the lens are low dispersion. One of the best prism (that is use to reflect light using the total internal reflection principle) is the BAK-4 which will enhance you viewing experience. One example of a lower grade prism will be the BAK-7. In order to enhance the reflection of light to maximize the image quality, it’s better to have prisms to be phase corrected, which is normally common in quality binoculars. Coated lens is vital in maximizing the amount of light transmitted to the eyes by minimizing the lost of light. The function of coated lens is to prevent reflection and refraction of lights so that greater amount of light will reach the eyes. Coated: A single layer on at least one lens. Fully-Coated: A single layer on all air-to-glass surfaces. Multi-Coated: Multiple layers on at least one lens. Within the $100 – $300 range, you should be able to get a binocular with fully-coated lens. High quality fully multi-coated lens will be able to reduce the lost of light to lower than 0.25%, pretty impressive as compared to normal ones still having a lost of light ranging from 5%-15%. The higher the twilight factor, the brighter the image produced in dim light areas. If you are going to use them prominently in dim light areas, it’s wise to consider those with higher twilight factor. As a rule of thumb, those above 18 should be good enough. It’s important to have a durable binocular that will stand the test of time. Durability is an important factor taken into account in the conquest of choosing a suitable binocular especially for hunting activities. Hunting is not like bird watching, there will be a lot of movements and you want to pick a binocular that can withstand a certain amount of pressure and corrosive substance. If there is one characteristic you want to have in a binocular, it’s the waterproof criteria. Even if you feel that there wouldn’t be any chances that the binocular will be in contact with water (that’s almost impossible during a hunting trip), you still need a waterproof binocular. Why? If it’s not made waterproof, the water vapor inside the binocular have the tendency to condense on the lens and make the lens foggy. It will ruin everything if that happens. Normally, waterproof binoculars are filled with gases to prevent the condensation of air vapor. Although not extremely important, this aspect should be taken into consideration because it might be troublesome to hunt with a heavy binocular. Anywhere between 20oz-35oz should be fine, the lighter the better. This is a relatively new feature that is introduced into the market. Essentially, it shows you the distance between the object you are viewing and your position. It’s extremely useful to know the distance to improve on hunting experience, though it’s not necessary. Just bear in mind that this is not a must-have feature in a binocular if you are going for affordable ones. This feature is only present in binoculars above $1000. Note: If you are keen on getting a rangefinder binocular, then check out this specific post for top rangefinder binoculars review. First of all, I hope that this detailed combo review + guide post can ultimately help you make a wise decision on choosing the best binoculars for hunting. If you take the time to read through these reviews (collectively around 6000 words), I am sure you will be able to find one that meets your criteria in terms of quality and the budget you have. Even as a beginner, I sincerely hope that you are willing to invest around $ 100 in your first binocular. If you are really tight on your budget, go for the Bushnell H2O which barely touches $ 100 while having most of the criteria that you would normally see in higher range products. Of course, if you really insist on getting lower-range binoculars, check out this post where we reviewed 5 binoculars that are all within $ 100. Even if you are planning on changing a better one in the future, think of the first binocular as a long term investment as you can probably use it for quite some time. There are people out there that are still using their very first binocular even they have bought many since then. Don’t attempt to go for low quality ones as they will potentially jeopardize your hunting/scouting/trip. Just as a reminder, this post doesn’t include most of the extremely high end binoculars that are might be what you are looking for. This post is meant to summarize some of the best binoculars within a certain price range that is affordable for most enthusiastic hunter. Side Tip: Keeping your binocular in good condition will help enhance the performance of your binocular. Check out our 4 main tips to clean and care for your binocular. What do you think about these binoculars? Have you used anyone of them before? We strongly appreciate your constructive feedback so we can provide better data about these binoculars.